5K (3.1 mile) race. Finish around the lakes. Fun Run (1.0 mile). Wear your Jingle Bells! Awards ceremony and prize drawings. a 501(c)(3) sharing the Good News. $15-$25 minimum suggested. T-shirt guarantee for pre-registrations by 12/8/2017 A.D.
Birmingham’s most beautiful course. Christmas holiday T-shirts, indoor facilities, gift bags, prizes, and great food! Prizes for overall winners. Love Birds release. Norton’s “Flowers for Finishers”. “A Taste of 280”™: Jimmy John's subs, Chick-fil-A, Papa John's Pizza, The Fresh Market deli trays, Earth Fare bagels and bananas, Golden Flake Snack Foods, Bud's Best Cookies, Ashley Mac's brownies, Smoothie King fruit drinks, Buffalo Rock, Starbuck's, Jason's Deli bottled water, Valley National Bank hot chocolate & cider. Entry forms provided by YourOffice, Internet services by Cahaba Web. USAmeriBank will again host our fine race headquarters facilities; "Best Swag in a Bag" gift bags will contain valuable free coupons from favorite area merchants; Love Birds will be released in special memory of Ellis Porch and Richard Tankersley; Norton's will provide "Flowers For Finishers"; plus a wonderful Christmas gift drawing after the races, courtesy of our many generous sponsors. Complimentary registration is offered to local Race Directors, BTC officers, BTC Committee chairpersons, and to all our 180 sponsors. Thanks for all you do! 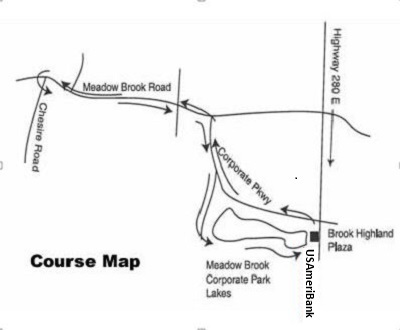 The USAmeriBank registration, start and finish lines are located 3.3 miles from I-459 on Hwy 280 East, at 1100 Corporate Parkway, Birmingham, AL 35242.